Seerstone.org: Animals of a Lesser God? Animals of a Lesser God? Who is right, you ask? My response: How should I know? I'm not a scientist. However, these discussions did get me thinking about the animals that are conspicuously missing from the Book of Mormon. For example, did you ever consider the fact that llamas are never mentioned; not even once? What about Jaguars? Pretty sure wicked King Noah had a few of those around! And check out this dude rocking a sweet jaguar pelt scabbard, with matching boots, and wristbands! Heck, they could've at least mentioned bobcats. What about condors, bald eagles, hawks, ravens and parrots; all prevalent in Native American lore and glyphs? If it had been up to me, I'd have mentioned those for sure! Coyotes, buffalo, and alligators? Nowhere to be found! No moose, no armadillo, no ocelot. What the heck? One would think that sloths, anteaters, and prairie dogs would at least deserve a mention in passing. While beavers got no respect from the ancient Nephites, their pelts eventually became quite popular with both colonial and European aristocrats in the late 1700s. 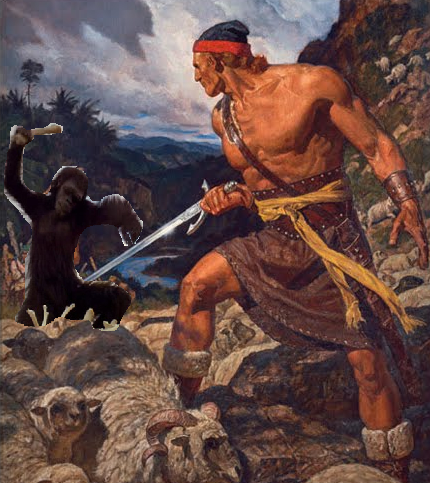 Despite the fact that I've read the Book of Mormon numerous times, I cannot recall a single mention of monkeys. Given the fact that we know the Nephites were actually just the Mayans; and that they lived in the jungles of Central America, it's pretty astounding that monkeys don't get more Book of Mormon play. There could at least be a "Parable of the Wayward Monkey Troupe" or a trusty monkey sidekick named "Max" to keep Ammon company. But "cattle", "swine", "horses", "elephants"? Bo-ring!